Large adult funeral urn for ashes is engraved with silver rose covered in nickel finish which is considered to represent ancient symbol of love and beauty which will make a perfect honor to present the funeral ashes in the urn. 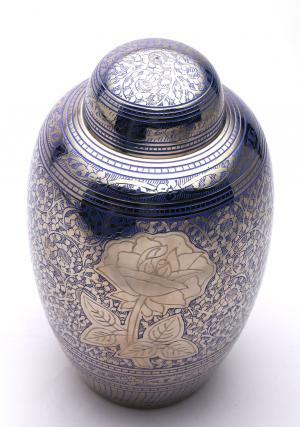 The large rose is covered with lilac blue leaves, is beautiful hand engraved with swirls in blue all over and with a blue fill design. 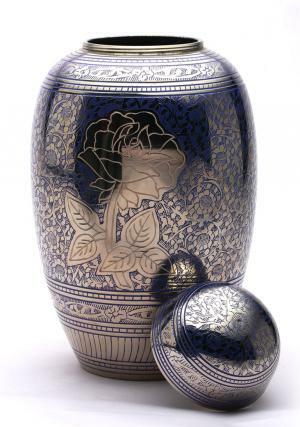 The rose is adorned by the nickel finish lying on the blue background. 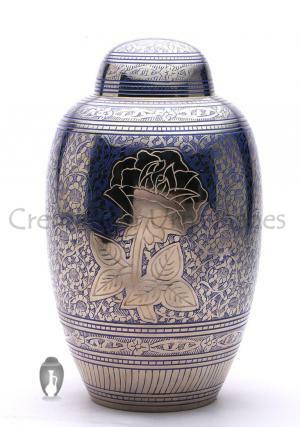 Blue rose large adult cremation urn for ashes features a secured threaded lid on the top. The perfect way to represent the love which you offer the soul of demised would be preserving ashes in large adult funeral urn. Large adult memorial urn would be a perfect decorative parallel fixture in the home. 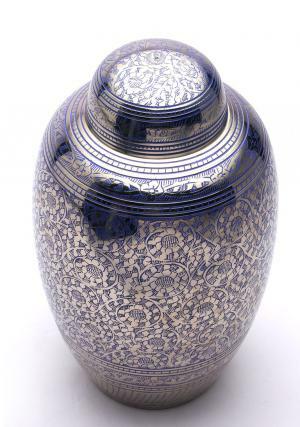 The urn is measured out to be a 1.68 KG in weight and 11 inch tall. It is free delivery within mainland UK and for more valuable offers or bulk order please contact our customer care team you are taken care by them.